Her contented smile contradicted the story which her face told the world; the tale of a recent encounter with a chimney, a dump truck, a tree or a stranger's boot. Not only was her face many shades of purple and black, she had lost everything or she would not be here - sleeping in a gymnasium, surrounded by strangers. My friend reached out to her. "You were really hurt. How are you?" No complaints, no words of suffering. The woman's "I'm fine" said more. "I'll get through this. I'm alive," was the unspoken message. The man on the radio - the one who made his living talking - was nearly speechless. His family home had sustained tornado damage. He must have mentioned how his boots were constantly wet from working on his house in the rain, so a listener drove from out of town, visited the station and handed the announcer cash, asking him to buy himself a new pair of boots. When he found his voice he replied, "so many people need this more than I. Let me find a place where this can do more good. Thank you, so much." More times than not, it seems we've become a country of whiners. A people interested more in taking than giving. Individuals who will climb the backs of our closest friends to advance our own interests and monetary goals. It seems that the slightest inconvenience is met with a roar. When a windstorm knocks down trees, sending people into the dark for a few days the letters fly to the papers and airwaves fill with voices of woe. "I pay my taxes! How dare I be inconvenienced my morning latte, my big screen tv, my internet!" In the old days, rather than wait for someone else, citizens pulled together and canvased the town with chainsaws so power crews could more easily get their work done. The old days seem to be slipping away. But something about Joplin is different. The shelters seem to be underutilized, which means hundreds of people have opened their homes and are sharing what they have with victims. Strangers have come to search in the rain, humidity, heat, and cold for the missing. They climb under the ruins of homes, slosh through waste-deep water, turn over boards and pieces of junk in hopes of not finding a body. They tell stories of strangers coming along, handing out bags of sandwiches and bottles of water. The outlook is more of "together we'll pull through this," rather than "why me?" or other complaints. It seems that every other corner in Joplin is host to a cookout. "If you are hungry, please, stop and have a hot meal on us." The word goes out "you have been so generous. Today we have all the blood, all the clothing we can use. But, please, remember us next week." 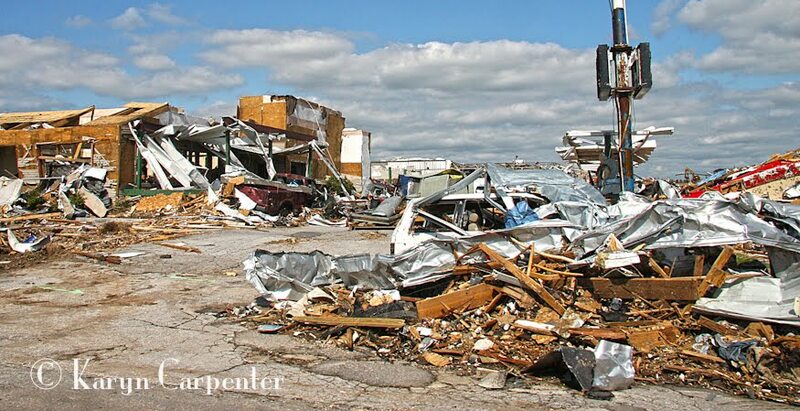 The EF5 tornado which ripped its way through this small Missouri town failed to take with it the soul of Joplin. Instead, it opened the hearts of millions around the world. Hundreds have arrived and thousands more are making their way to this little known part of the country. 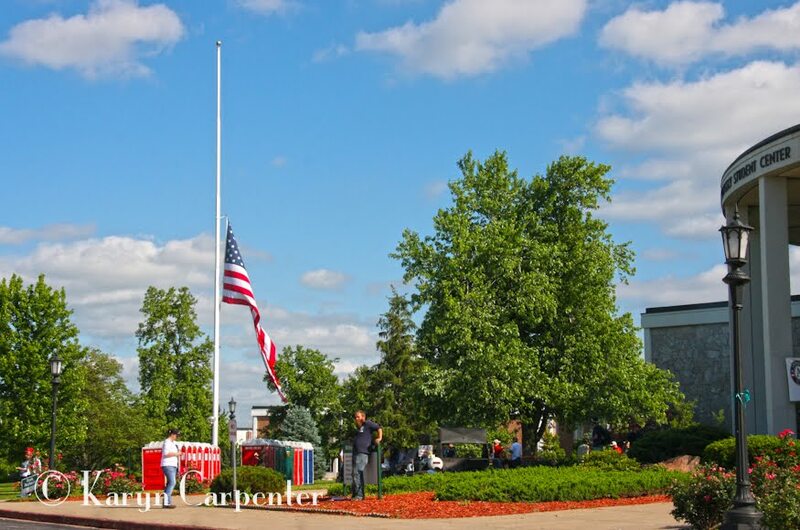 And, with the help of millions who've given their money, their time, their prayers - the community will rebuild. If only there was a way to bottle this spirit; to pull it out once a year. To inflict a booster shot to everyone in the world, we'd be a peaceful and much more powerful force in the universe. Photos: Flag flies at half-mast at the Missouri Southern State University campus which has become the central location for volunteer opportunities, a Red Cross Shelter, and Humane Society local in Joplin. The clean up and rebuilding following the devastating EF5 tornado which ripped through Joplin a week ago will continue for months.